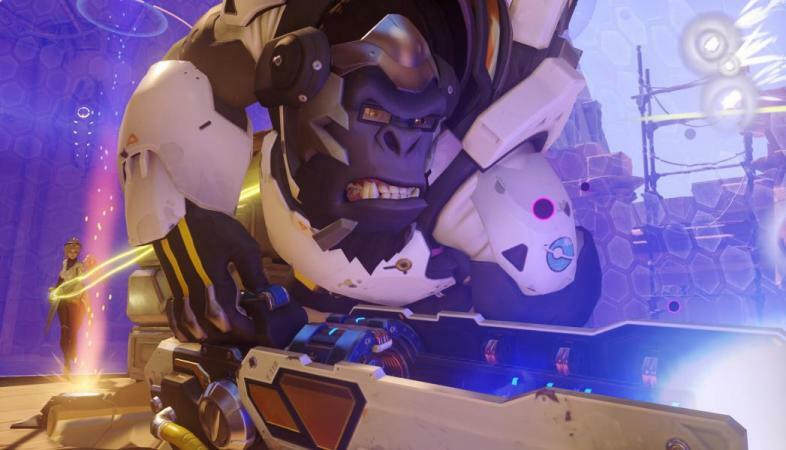 Blizzard has released new footage of one of their tank characters, Winston. Winston looks as though he’s going to play similar to the Pyro from TF2 in terms of offensive capabilities with a small bit of utility support on the side. Winston’s abilities all support him being a close range fighter. His jet pack jump will put him right where he needs to be at all times, which is in his enemy’s faces. The bubble shield will keep both him and his teammates alive in case they need to take an objective or just need a moment away from the opposing team, and will stay until it is destroyed. What’s interesting about this shield is how teammates can shoot out of the bubble but enemies can’t shoot in. His ultimate will ensure that he’s always pushing out damage and knocking away enemies that could be trying to push the cart or are attempting to dig into a defensive position. It also appears as though Winston gains a huge buff to his health (he goes from 575 to 1000 health!) and a reduced cool down on his jet pack jump. Winston’s Tesla cannon further supports his endeavors as a close range tank since its range is limited but, based on the trailer, is strong enough to tear through light classes with ease.